In April of 2015, the federal government began revisiting an investigation of Jeep vehicles, including the Jeep Grand Cherokee and Jeep Liberty, due to serious dangers of post-collision fuel-fed fires. If a family member was injured or killed by an exploding Jeep gas tank, contact the Willis Law Firm to explore a Jeep fire lawsuit. 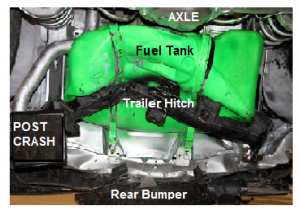 Rear-impact gas tank explosions are extremely dangerous, and Jeep is known for them. Yet despite a Jeep gas tank recall issued by Chrysler in 2013 for 1.56 million Jeep Liberty and Jeep Cherokee SUVs, Chrysler has repaired very few of them. Federal safety officials believe it will take Chrysler five years to repair all such vehicles whose fuel tanks could explode after a rear-end collision. Meanwhile, Americans continue to die from exploding gas tanks. You may ask why are Jeep gas tanks exploding. The problems involve a defective design in which the vehicle’s plastic gas tank is found behind its rear axle and below its rear bumper - alarmingly like that of the notorious Ford Pinto, which was recalled in 1978 after dozens of fatalities because of similar explosions. If the high-clearance Jeep is in a rear-end crash where it’s struck from behind by a lower vehicle, its unprotected Jeep gas/fuel tank could be ruptured by the rear vehicle’s front bumper, and a gas tank explosion and fuel-fed fire could severely injure or kill occupants. In fact, 70 deaths so far have been attributed to defective Jeep gas tanks. In a crash, a solitary spark from the impact or from an electrical source could trigger a huge explosion of a gas tank and its fuel. Drivers and passengers could be trapped inside the vehicle while it burns. Americans can fight back with exploding Jeep gas tank lawsuits against Chrysler. In fact, they already have -- with a dramatic multi-million dollar verdict. On April 3, 2015, a jury in Georgia awarded $150 million to the family of a 4-year-old boy who was killed in a 1999 Jeep Grand Cherokee which had not yet been recalled. This was the first Jeep gas tank explosion trial. Jeep gas tank recalls have not come quickly enough to save the lives of as many as 70 Americans killed in Jeep rear-end impact explosions. In part that’s because Chrysler refused at first to issue Jeep recalls. The federal government initially raised concerns which might merit Jeep gas tank recalls in 2010. However, Chrysler denied that its vehicles had any defects. The U.S. government insisted that Chrysler recall more than 2.5 million vehicle with defective gas tank designs, yet Chrysler refused to do so. Finally in June of 2013, the federal government, in a compromise, let Chrysler issue Jeep fuel tank recalls for just 1.56 million older Jeep Liberty SUVS from model years 2002 to 2007 and Jeep Cherokee SUVs from model years 1993-2004. Chrysler did not recall a million Jeep Grand Cherokee SUVs from model years 1999 to 2004, which had been on the recall list originally of the National Highway Traffic Safety Administration (NHTSA). But repairs since the Jeep recall have been agonizingly slow. At first, Chrysler only would agree to install a trailer hitch behind the gas tank to fix the problem. Yet just 12 percent of vehicles had been altered this way a year and a half after the Chrysler recall, and besides that, Chrysler didn’t perform any crash tests to determine if a trailer hitch would protect a Jeep gas tank. Some safety experts say solely a metal skid plate or shield could protect such gas tanks in rear-end crashes. Without it, there’s a strong chance of a Jeep gas tank exploding. The problem is largely limited to older Jeep vehicles. Chrysler started moving Jeep gas tanks in front of the rear axle and added a metal skid plate as standard equipment in 2005 -- again, too late for many victims and potential victims of Jeep gas tank explosions. Yet even for recalled vehicles, reportedly just 27 percent of Jeep Liberty SUVs and only 4 percent of Jeep Cherokee vehicles have had repairs since the June 2013 Jeep recall. Meanwhile, Chrysler continues to insist to its customers that their vehicles are safe. To fight back, you can get a Jeep fire lawyer or attorney for your case from the Willis Law Firm, a firm nationally known for its defense of injured Americans’ rights after a massive recall by Ford of Firestone tires in its vehicles. To get started, contact us today and you’ll receive a free legal evaluation of your case. Then we can explore together your prospects for a successful Jeep fire lawsuit to achieve financial recovery for you and your loved ones for medical bills, lost wages and pain and suffering.